Shiplap is a great technique to give any space the vintage-farmhouse style. Oftentimes, home renovators can find shiplap in old homes under drywall. If you do not want to cover the entire bathroom with it, just go for a subtle approach and only cover one wall as an accent wall to create interest. Consider replacing your vanity or sink fixture with repurposed furniture, like an old dresser. True vintage-farmhouse style takes older pieces of furniture and spruces them up to give them a new and more modern look and feel. Take an antique dresser, strip it, then repaint it a solid color (we recommend white). To achieve that worn and lived-in look, lightly sand the joints, corners, and edges with sand paper. You can find some great DIY pieces by visiting antique shops, flea markets or antique festivals. If you do not want to do the work yourself, you can also find a company that specializes in repurposing old furniture. To round out the vintage-farmhouse style, decorate or replace your light fixtures with details inspired by a barn. Consider gooseneck pendant lighting to put over the sink and dark colored handles on cabinets to offset the light-colored shiplap/vanity area. Switch out the sink with a deep, white farmhouse sink. Install an accordion mirror, a wooden stool, or large hooks for hanging towels. To really embrace the vintage-farmhouse look, repurpose feed sacks as valances, or curtains over the windows. You can also use an old metal egg or fishing basket to store toiletries. One really beautiful and unique way to remodel your bathroom is to switch out your swinging bathroom door to a sliding barn door. This a great idea if you have a doorway leading form a bedroom to the bathroom (like a master bedroom). You can find barn doors at flea markets or a company that sells them. If you end up purchasing a used door, try painting it white or giving it a light colored stain to make it look modern and earthy. A really easy way to remodel a bathroom on a budget is to update the paint. A vintage-farmhouse bathroom style is going to employ a neutral color palette. Use light earthy tones like grays, whites, and browns. To keep your space from feeling bland, add pops of color through artwork, decorative towels or shower curtains. Pick decorations and pieces with texture and do not be afraid to incorporate nature-inspired accents like plants or flowers. When you think a barn or farmhouse, big red wooden doors with white accents come to mind. It is an iconic look and one that can be included in your own bathroom remodel. A cost effect way to implement this look is to paint your existing cabinets and add the z-back frame using wooden slats. There are many color combinations that can be used; white on white is a very popular bathroom look and still provides that vintage-farmhouse feel. If you’re feeling bold, you can replicate the barn door look by using red and white paint, which can also add a great pop of color. Another great bathroom remodel idea to achieve the vintage-farmhouse look is to replace your current tub for a clawfoot freestanding tub. This is more on the expensive side for a remodel but perfectly captures the look and feel of vintage-farmhouse. When replacing an item in the wet area (toilet, tub, shower, sink) be sure to leave your pipes and water hookups in their original place and match up the fixtures to the original piping. Switching out the water lines can be extremely expensive when doing a bathroom remodel, but still an option. White tubs are the most common and least expensive, but there are certainly other color options for your freestanding tub if you choose. You can use an old trough as a sink or even an old shaving bowl can be turned into a sink. This is a fun and unique way to transform your bathroom to something with character and charm. For example, a shaving bowl used as a sink on a barley table is perfect for a smaller space or half bath. To hide the plumbing, use table skirt made from feed sacks or linen cloth. For a larger bathroom, like the master, the trough is a great alternative to traditional his and hers sinks. It provides plenty of sink space and perfectly achieves the vintage-farmhouse look on a budget. Before purchasing pieces, especially antiques, ensure all knobs, drawers, and cabinets work properly and with ease. Trying to replace broken or missing parts on a one-of-a-kind item after purchase can be extremely expensive and near impossible. When you are searching online or at a market, shop smart and make sure that the tub, sink, cabinet, etc. all have the original knobs, matching hardware, etc. 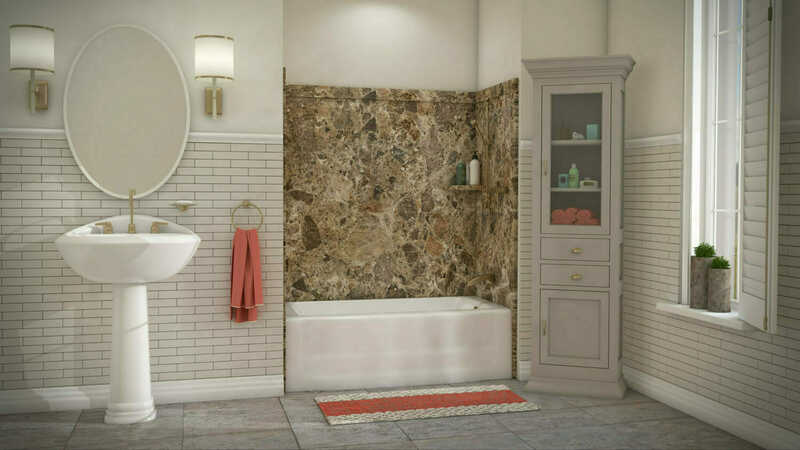 One of the easiest ways to remodel your bathroom is to work with what you already have. For example, if you live in an older home, you can strip any existing drywall to expose original brick or stone walls. It is also possible that carpet has been placed over original hardwood floors that may be worth restoring. Take the time to do a little research on your home to see if you can use any original architectural fixtures that could add to your vintage-farmhouse bathroom.